I attended OSU during the Hayes era, and was in the stands the first time an untested freshman, Archie Griffin, set in formation behind Greg Hare (I think.) The game was against North Carolina, and this unknown ran for 239 yards. O-H, indeed! The second half was a bit of a blur. You see, back then we were young punks who would live forever. We would smuggle a fifth of 151 to our seats. We’d order a Coke, and brashly pour half of it out, right in front of the vendor. Our cups half empty, we’d fill to the top with that fiery demon rum. We’d do that until our bottles were empty. When the game ended, we’d head to High Street and finish our evening with endless buckets of beer. We’d dip our glasses into a communal bucket until it was empty. Like our earlier rum, we’d repeat until we couldn’t do it anymore. In other words, until closing time. I digress with this story so you know that I was just one of thousands of students who would do their rendition of Saturday Night in Columbus. I studied, mostly, during the week, then I’d partake in “campus life” on weekends. In other words, I didn’t stick out during those years; I fit in. One of many. Even though I was only casually informed, it was impossible to not follow stories, rumors and the like. Woody had a show (on WTVN 10, I think) every Saturday night after a game. He would pontificate on that week, followed by parading in some of his players. You think they were coached on the field? I can only imagine how they were coached in preparation for this show. Each one was scrubbed clean, in a suit and tie, and would politely answer questions posed to them by Coach. It was a bit corny, even then, but we loved it. We loved to laugh at how they’d better answer correctly and with the right intonation, or we’d imagine the hell that would be unleashed after. Anyhow, we’d get news that the rest of the country wouldn’t. Player troubles. Things that went on in the dorms. That sort of thing. But we’d also hear about Woody going to Children’s Hospital to visit sick kids. Woody helping someone who was down on his luck. Woody teaching a military history course that he’d make his players take. Like all of us, there was plenty of good to go with Woody’s bad. His tantrums. Impatience. He was human. He was loved, though. One year, his players got together and bought him a truck. Take that, NCAA. I remember thinking this guy’s actually pretty cool. For an old man. Back then, we were cocooned on campus, most of us didn’t have a car. We’d hear about places in Columbus, but for us, Columbus was campus. Period. Once though, we were curious about the Jai Lai Prime Rib Restaurant that was located on Olentangy River Road. Someone had a vehicle, so we took the trip. We didn’t get any further than the lobby when we saw Coach. He was with some recruits, taking them to dinner. 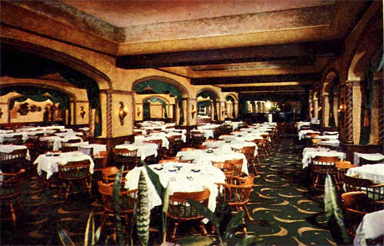 Interior of the Jai Lai, in the days when it was expected you’d wear a suit and tie to dinner. We froze in our tracks. We couldn’t have been more dazed than if Mick Jagger was standing there. Woody decked out in a suit and tie, as were the recruits. The restaurant was rocking on a Friday night. We were so intimidated that we turned around and left. Who were we kidding anyway? We didn’t have enough money to buy dinner, and we were sure we could get our drank on cheaper on campus. That night, I actually saw Woody Hayes in the flesh. That’s not my Woody Hayes Story, though. Fast forward to some time later. I don’t remember the year, but it could have been about 1974. Woody Hayes had his first heart attack. The entire campus was shocked. Would he be OK? Would he retire? This was big, kids. It turned out to be a mild one. He was out of the hospital in under a week. Bullet dodged. Shocker: In 1974, I ran. Not like a runner, mind you. But I ran. Back then it was called jogging. I lived on 15th Avenue near Summit Street. I would start there, run through the oval, then past the towers, headed toward the west side of Ohio Stadium, before turning to head home. That was my usual loop. That day, I was heading north toward the west side of the stadium. No one was around. I think it was a Sunday morning. In the distance, I could see someone walking from the stadium heading south. Soon, the figure would get closer. It was apparent I would be running past this person. The figure grew larger as we approached each other. Holy Crap! It’s Woody Hayes, fresh from his heart attack! I was imagining he was watching film or just trying to get caught up. I was trying to think where he might be headed. I had enough time to get my act together. I decided I would say something to him. I will never forget that 10 second intersection in my life. I remember it like it was yesterday. Good guy, that Woody Hayes. He actually made an impact on me. All these years later, I still ask myself how I’m doing. Am I living up to Coach’s expectations? Corny? Maybe. In my book he’s the greatest coach that Ohio State’s ever had. And yes, I’ve met Earl Bruce and Jim Tressel. I’ve had conversations with them. Both solid, upstanding guys. You can just tell why they’d made it up the mountain instead of someone else. Woody’s my main man, though. All these years later, I find that Woody Hayes was born on Valentines Day. In fact, I found out last year that he would have been 100. Being a brewpub, we’re not exactly a go-to locale for lovers. Especially on Valentines Day. So Woody Haze 100 was born. It’s my Valentine to Coach. 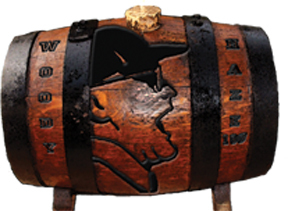 As are wont to say, we called it Woody because it was matured on sturdy oak; we call it Haze because it’s unfiltered. Like the Man. Woody because it matured on sturdy oak. Haze because it’s unfiltered. Like the Man. Now you know the rest of the story. When you order your snoot of Woody Haze 101 out of the firkin tomorrow, think about someone who was born in these parts on a cold February day and who would go on to be a legend. We could do worse.